it seems the dining table blocks the walk way. How lovely! The colors are so sweet! Ah, I love that. It looks like something right out of a fairy tale! 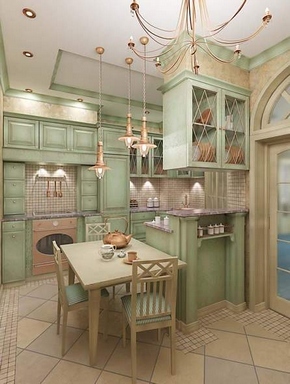 This French Country Style is timeless yet classical interior architecture. The color palette is so relevant with today's trending colors. That really looks like something taken out of a storybook, too cute to actually live in, but nice nevertheless. Great style. I really like this. Beautiful color and design.